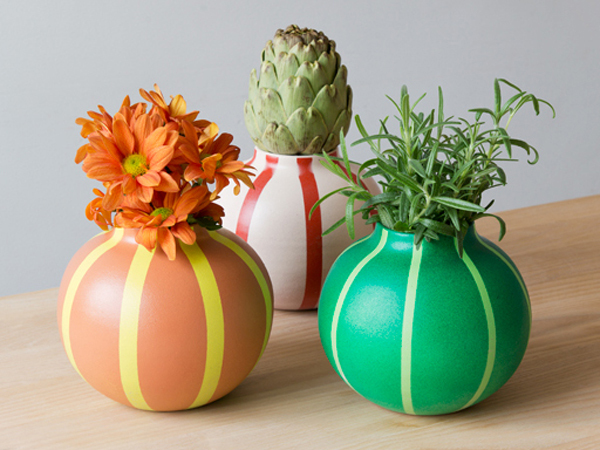 Norwegian designer Kristine Five Melvær is showing four new products at Salone Satellite this week, including a series of lacquered stoneware vases shaped and coloured like fruits, vegetables and flower bulbs. The other new products developed by the designer are a pair of oversize floor lamps, a set of brightly coloured wood and glass table lamps, and a series of softly rounded wooden fruit bowls. Homebuildlife subscribers will be able to view our full report from the emerging talent showcase early next week.